I completed the Boulder Half Marathon this morning and it went really well. I must be learning my pace. I ran this exactly how I described my plans in earlier blog posts. I ran the first half nice and easy – maybe a 9 minute mile pace. Upon turning back at the 6.55 mile marker, I dropped a minute or more off my pace. Man did that feel good. But let me start at the beginning. For breakfast, I ate a banana and a tasty organic tangerine. I also had a mug of java – half decaf, half the real deal. I included a sip of OJ and a glass of water. I reached the Boulder Reservoir at 7:15. It was nice being able to park there close to the race start in terms of not having to commit to my race gear until the final minute. It was chilly as I expected but the wind seemed fairly calm. I committed to the two race jerseys I described in my last blog post, along with a thin pair of Under Armour tights and runners gloves. I figured I didn’t really need the tights, but they kept me comfortable while waiting for the race to start. And I felt confident I wasn’t over dressed as easily 80% of the crowd was wearing tights of some sort. I also had to make a decision on what hat to wear. I brought a fleece runner’s hat and my Barr Camp runner’s cap. I have three fleece hats of varying thickness. This was the thinnest – my baby bear edition. But the idea of wearing it for 13.1 miles didn’t appeal to me. Fleece hats get so sweaty. Since the wind wasn’t strong, I figured my ears would be fine and opted for the runner’s cap. It’s easy to pop that thing off and force the sweat out of it by swinging it a few times. Plus the bill shades the sun – which came out from the clouds right at the start of the race. I launched my playlist in shuffle mode and started the race to REM. Seemed appropriate. By 2 miles, I’d warmed up nicely and would not have needed the tights, but they were such a light pair that I felt fine with them the entire course. I noticed the first race photographer at this spot too – I didn’t know this event would have them. I’m guessing the Flat Irons were in the background at this spot so I hope they got a picture of me. I was dressed head to ankle as black as a cat burglar. Ideally, this color selection will make me appear more slender than the white compression jersey I wore in Moab. The picture above might not show this, but in other pics it made my prominent belly pop. I removed my gloves at 4 miles, and also surrendered a minute to take a leak. A minute well spent I assure you. I encountered the lead runner around 4.5 miles coming back on the out and back course, and saw the first female around mile 5. When I say she was pretty in pink, she was wearing pink and she was a blond cutie. Boulder’s finest. Upon turning back myself at the half way point, I did exactly what I had hoped I would do – I turned on the jets. It could have been the down slope, or it might have been Green Day. ENGLAND! I feel like I dropped a good 90 seconds off my pace. I felt awesome. And I wasn’t the only one – a couple of guys and a couple more women had the same plan and challenged me. But I kept strong and didn’t let anyone surge past me until the final half mile when I decided to coast in for a warm down rather than race it in. I ran strong the entire way back and that was my reward to myself. I’d accomplished my workout plan and didn’t feel a need to kick. I don’t know my true chip time yet but the clock read about 49 minutes – which is the same time I ran in Moab. This felt so much better though. 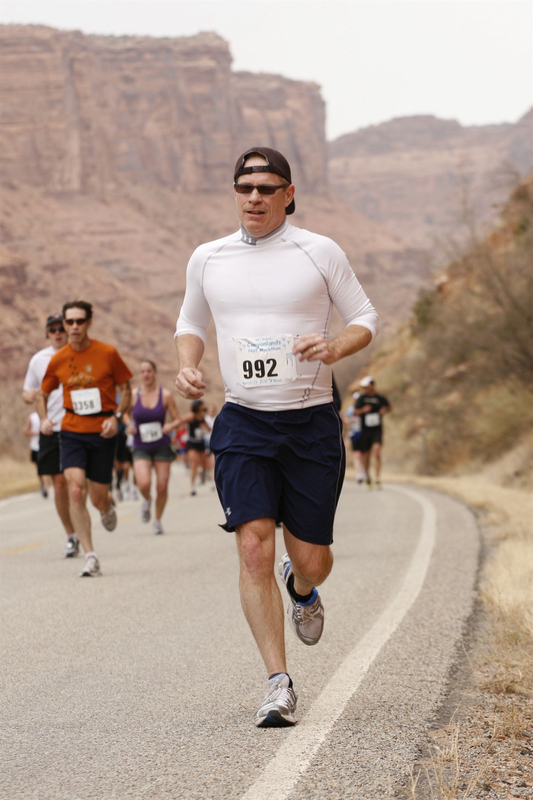 I started out slow the first mile in Moab but otherwise ran a strong, consistent pace. The final 3 miles in Moab were difficult as the course sloped uphill. Today I ran easy for the entire first half. And it was noticeably tougher than Moab because the first 6 miles were completely uphill – an elevation gain of 300 feet. And at 5200 feet, you feel every one of those 300 feet. So controlling my pace was smart. The return back down those same 300 feet felt great. I started so fast between miles 6 and 7 that I didn’t know if I could maintain my pace. I know I dropped back off a good 30 seconds, but overall I stayed strong. I’m really glad I decided to run this event. Drinking a Boulder Beer at the finish, I sat down next to this guy, he said his name was Jim Frimers. Not sure if I spelled that correctly, but he’s a writer for Trail Runner Magazine. I really enjoyed talking to him and plan to look up his column. Next weekend I’ll meet up with A Lo Hawk to hike the Colorado Trail. Looking forward to that. You’ve got the long steady run down. How about some speedwork, intervals on the track? Yep, I’ve been wanting to get on the track. And I occasionally fartlek on my 4.5 mile runs. But I’ve also been thinking about targeting some 5Ks. As you say, I’ve got the long run down. I am planning for some more half marathons this summer on trails (because trail runs are just so freakin’ cool), but doubt I’ll do anymore road runs at that distance. My speed objective is centered on running a faster time this year in the Bolder Boulder.